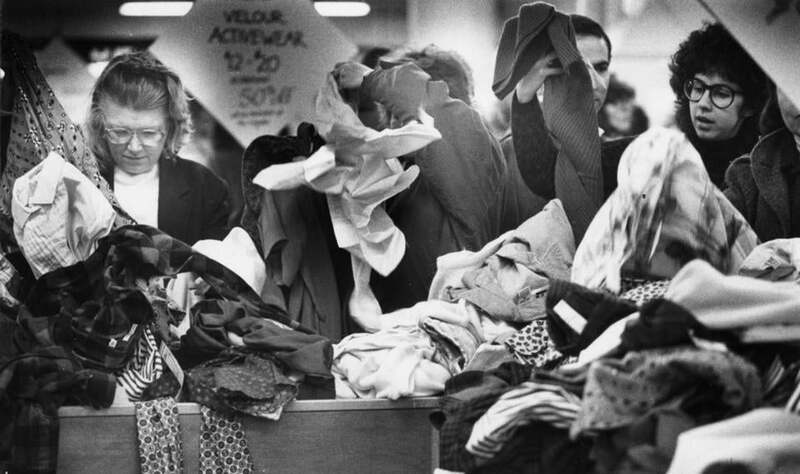 Over the decades, Filene’s Basement in Boston became famous for its messy bins brimming with designer merchandise. Filene’s Basement survived two bankruptcies and the loss of its flagship Downtown Crossing store, but competition and marketing missteps are forcing the century-old Boston institution to take its final markdowns and close the company’s 21 remaining shops. The legendary discounter filed for bankruptcy protection yesterday - the third time in just over a decade - and plans to hold liquidation sales during the holiday season before shutting its doors for the last time in January. It’s a disappointing but not unexpected turn for the struggling merchant, which began in 1909 as a place to sell excess clothing and other goods from the Filene’s department store upstairs on Washington Street. Over the decades, the quirky shop became famous for its messy bins brimming with designer merchandise, an automatic markdown system, and the “Running of the Brides’’ events at which frenzied women tore through racks of bargain-priced wedding gowns. 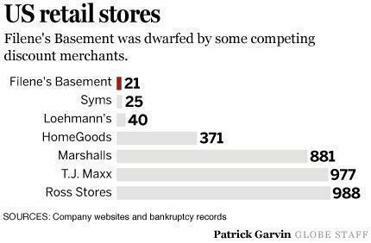 Filene’s Basement split from Filene’s department stores in 1991 and outlasted the founding chain, which disappeared a year after being bought by rival Macy’s in 2005. Retail analysts said the demise of Filene’s Basement reflects the company’s failure to improve its buying clout, compete against bigger rivals, and combat a growing number of challenges from outlet stores and online merchants such as Gilt Groupe and Rue La La. In addition to specialty online sellers, Riley said, more traditional retailers have become better at selling on the Internet. “It’s attacks from all sides,’’ he said. Syms Corp., which bought Filene’s Basement at an auction in June 2009, is also filing for bankruptcy protection under Chapter 11 and closing its 25 clothing shops. The New Jersey retailer had hoped to shore up the Basement by uniting the two brands. But the marriage has been rocky, and a move to open joint stores that featured the merchants’ offerings under one roof alienated customers of both companies at a time the economy was weak and consumer spending slowing. The two damaged businesses, which suffered significant losses, are now poised to go down together. Syms started looking for buyer earlier this year, but there were no viable bids. The company’s interim chief financial officer, Gary Binkoski, said in court records filed in Bankruptcy Court in Delaware that the best option “is a prompt and orderly wind-down of the retail businesses that will capitalize on the upcoming holiday shopping business.’’ It also plans to sell off real estate owned by Syms, subject to court approval. Syms and Filene’s Basement are still accepting returns for the next 30 days and honoring gift cards. Filene’s Basement has about 1,555 employees at its stores, Auburn distribution center, and other offices. In recent weeks, the chain’s escalating problems became evident. The Globe reported plans to close six stores, including four in Massachusetts, by the end of the year. Filene’s Basement, beloved by Boston Mayor Thomas M. Menino and legions of local shoppers whose ranks have been dwindling, inspired a 2010 documentary celebrating the 100th anniversary of the brand. But the closing of the Boston Downtown Crossing site in 2007 - to make way for a redevelopment project that still has not moved forward - and the chain’s inability to replicate the cachet of the flagship has left many consumers with a heavy dose of nostalgia. 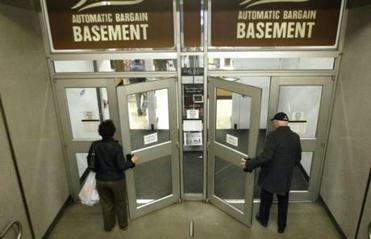 For Menino, Filene’s Basement “officially died five years ago’’ after the company shut down the Downtown Crossing shop. He reminisced yesterday about the Brioni ties, Oxford suits, and other treasured bargains he discovered at Filene’s Basement. Menino said he never believed Syms’ promises to bring back Filene’s Basement to Downtown Crossing. In recent years, Filene’s Basement lost buying power with merchants and its legitimacy with consumers eroded as the competition intensified - even after it teamed with Syms - according to Marshal Cohen, chief retail analyst at the NPD Group, a market research firm in New York. During the company’s last bankruptcy in 2009, filmmakers Michael Bavaro and Sue Edbril were trying to finish their documentary, “Voices from the Basement,’’ which focused on the aura of the Downtown Crossing store and profiled its employees. With the company’s future uncertain, they opted for an optimistic outcome. Now, Bavaro said, he will probably rework the final scene. Globe correspondent Christina Reinwald contributed to this report. Jenn Abelson can be reached at abelson@globe.com.